The original release of 'Elvis' (1973) was certified 5x Platinum by the RIAA - one of the best selling albums of the seventies. Now available for the first time on CD! Includes: The original album tracks - and - album artwork. 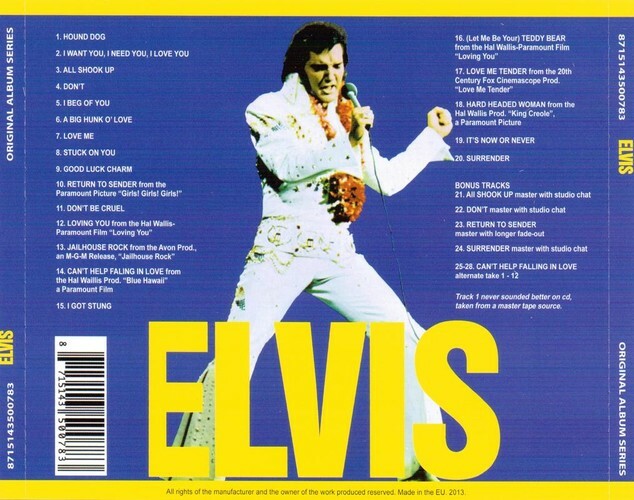 Also 'Hound Dog' in the best possible sound and as a special bonus: 'All Shook Up', 'Don't' and 'Surrender' complete with studio chat, 'Return To Sender' with longer fade-out, and the first 12 takes of 'Can't Help Falling In Love'.